Laurence Gonzales’s book Deep Survival (reviewed in an earlier edition) is probably the best book ever written on survival psychology. The subtitle “Who Lives, Who Dies and Why” should tell you that you need to read that book. I used it as a reference and inspiration for many of my articles and presentation. Basically your brain manages your survival and you need to understand how that works in order to manage your brain under stress. 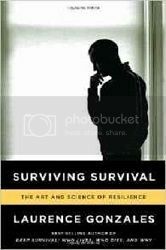 The first book focused on how we respond to survival situations by analyzing the experiences of people who have survived some horrific situations and injuries. Lets take a look at her newest book, Surviving Survival. In this new volume Mr. Gonzales takes us beyond the survival event to examine the physical and psychological aftermaths. Here we explore the post traumatic challenges that the victims faced. We examine how the victims of alligator, shark and bear attacks coped, or failed to cope, with the mental effects of these events. We also look at the impact of losing a child and the effects of a military veteran whose job was to reassemble bodies blown apart by IED’s prior to shipping them home. The victims survived these events only to be rendered non-functional or even suicidal because of what happened to their minds. These kinds of stresses completely break down the normal mental balances and perceptions. There are detailed explanations of how the brain process’ stress and how victims have used this understanding to adjust and recover. Of particular interest is the section on how Aron Ralston’s mind processed the situation and eventually allowed him to cut off his own trapped hand to escape from Blue John Canyon in Utah in 2003. One of the most fascinating ideas in the book is that we have three levels of the mind. As the author put it “the human mind, the dog mind and the frog mind.” Under survival situations we often need to use the more primitive minds or as we call them “instincts”. Survival skills are human, survival instincts are more animal and the “sixth sense is real and resides from our most primitive levels.” When something just doesn’t seem right, when the hairs on the back of our neck stand up, this is the sixth sense picking up odors, vibrations, facial expressions, sounds that we do not consciously, acknowledge or understand. The book documents two cases where the conscious human, logical bran overrode the sixth sense with catastrophic results. If you want to go beyond simply starting a fire and building shelters to explore how survival really works, I highly recommend this book and it predecessor. It was noted that World War Two veterans suffered less post-traumatic stress syndromes that those of more recent conflicts. It was postulated that they may have experiences more stress from the depression and from a harder life prior to combat [or been more religious and family anchored]. Having survived the initial event, many were unable to cope with the effects. They had ruined lives and occasional suicides.